In this webinar, we examine ways to make analysis of GRC information analysis and action easier, faster and more accurate. Learn ways to simplify identifying, sorting and using GRC information in every line of defense. The governance and management of performance, risk and compliance is a challenge that grows larger every day. The sheer volume of information both within and outside of the organization is daunting. Weeding through vast amounts of data in which relevant information is buried is nearly impossible without effective technology support. Even worse, that relevant information is often held in databases that are not connected in anyway to the tools and systems used to manage risk and compliance, and so it often is not considered at all. But there is a way to make the process simpler and more effective. In this webinar, we outline ways to make sure that analyzing and taking action on GRC information is easier, faster and more accurate. 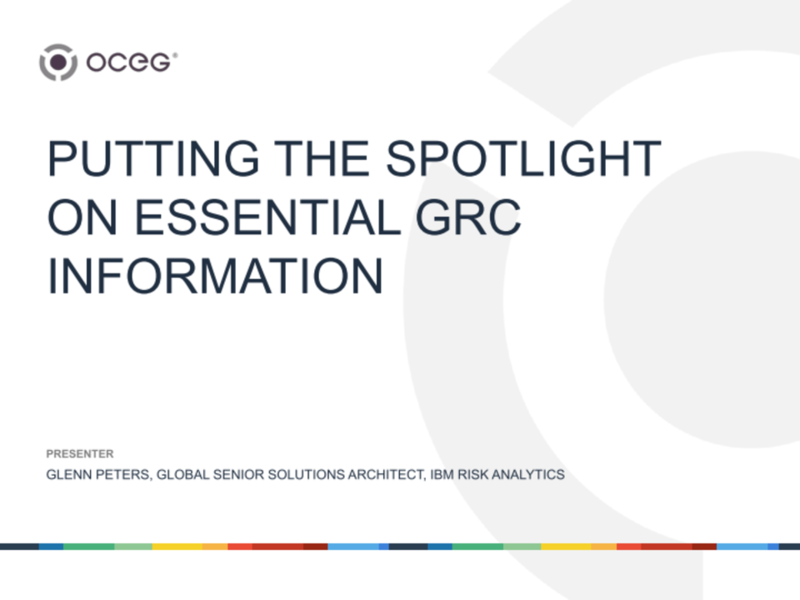 We have emailed instructions to access Putting the Spotlight on Essential GRC Information Slide Deck to . Make sure the email arrives in your inbox: either add "support@oceg.org" as a safe sender to your email platform, or if you use Gmail, drag our email into your Primary tab.